The Hankook Ventus V4 ES H105 tire provides an ultra high performance all season design that make it easy drive on wet or dry roads throughout the year. The tire’s construction and tread compound give it excellent handling and response on the street or highway. The tire itself features a directional tread pattern to go with a center rib and circumferential grooves for added performance. Hankook also has what they call a ‘controlled footprint shape’ which it says offers more predictable handling and better overall wear on the tread. You can find the tire available in a wide variety of sizes to suit any type of performance vehicle. Hankook also includes a 40,000 mile tread warranty on sizes 40 and up. 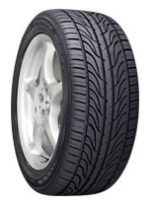 Prices for this Hankook tire range from around $80 for the 15″ series, to approximately $300 for the 24″ models. Who Are The Hankook Ventus V4 Tires Designed For? Hankook has designed the Ventus V4 ES especially for drivers of coupes, sedans and other high performance vehicles who are seeking an ultra performing all-season tire. Hankook tires backs up the Ventus V4 ES H105 with 5 year or 40,000 mile tread wear guarantee. This applies to 40 series models and up. A uniformity warranty for the first 2/32″ of tread wear is also included. Materials and workmanship is backed by a 5 year warranty that includes free first year replacement or first 2/32″ of wear, followed by a prorated amount for the remaining time period. Finally, Hankook provides a first 25% of wear road hazard protection as well.